Interview: Michael C. Hall on his pivot to comedy with Documentary Now! 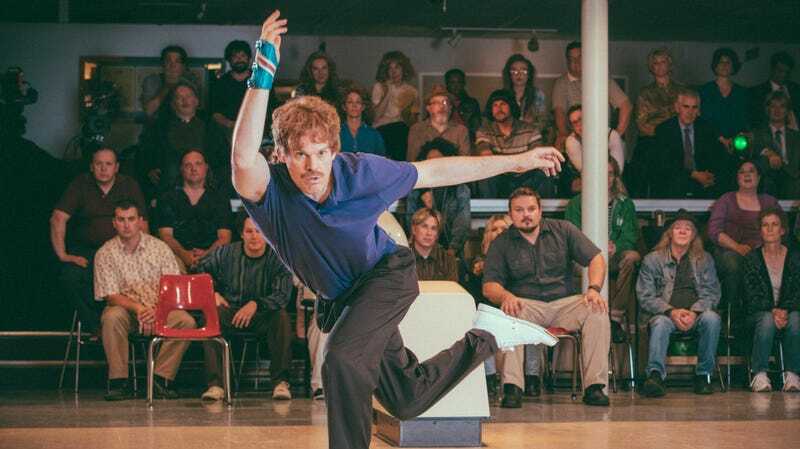 Michael C. Hall has gone from laying out bodies to knocking down pins with Documentary Now! Theater audiences have seen Michael C. Hall cut loose from time to time, as the Emcee in Sam Mendes’ revival of Cabaret or as the titular transgender glam rocker in Hedwig And The Angry Inch. But for television viewers, the perception of the actor is shaped by a pair of long-running dramatic roles that put him in close contact with the dead: first as closeted, funeral-home good son (and survivor of TV’s most traumatic carjacking) David Fisher on Six Feet Under, and then as avenging killer of killers Dexter Morgan on Dexter. It’s not like either of those shows lacked for leavening moments of humor (intentional and unintentional), but it’s still been interesting to watch Hall steer himself toward more outwardly comedic work in recent years. He channeled some of that old premium-cable murderer menace as The Bulgarian in 2018’s Game Night, and put a face on a confectioner’s ambitious attempt to disrupt Super Bowl advertising in the one-off Broadway benefit Skittles Commercial: The Musical. He’s following those projects up with a deeply weird performance as Billy May “Dead Eyes” Dempsey, one of the fictional professional bowlers at the center of Documentary Now!’s third-season finale, “Any Given Saturday Afternoon.” Based on the 2006 nonfiction film A League Of Ordinary Gentlemen, the episode pits Billy May against the likes of flamboyant alley scion Rick Kenmore (Tim Robinson) and prospective comeback kid Larry Hawburger (Bobby Moynihan). The A.V. Club spoke to Hall about his recent pivot to comedy. AVC: Are you at a point in your career where you’re more actively seeking comedic work? Michael C. Hall: I certainly haven’t turned my back on things that aren’t more skewed toward the comic, but I think I have gravitated toward that stuff. It probably has something to do with what I’ve done or what I’ve been known for and my own sensibility and sort of desire to do things that are lighter or more silly, even. It’s just what’s been happening, and I’m all for it. AVC: You’ve only got a short amount of time to establish a character within an episode of Documentary Now! What was going through your mind about building the character and making an impression within that limited time span? MCH: I think what was going through my mind was just “bowl strikes.” I’m not even totally kidding. It’s more of a sketch than a detailed painting that you’re presenting with something like this. Watching the documentary that they were basing this on was helpful. I definitely wasn’t playing the character upon which mine was drawn, but it was cool to see him and as much as he was clearly a guy who didn’t get caught up in the energy surrounding these bowling tournaments and events in the same way that everybody else who’s competing seemed to. He was able to just maintain this kind of even keel and was unaffected by it. Definitely loved to win, but also didn’t have the same kind of high-pitched investment in it all. He just loved playing games. He was kind of a nerd. He seems kind of like he’s an 85-year-old in a younger man’s body and life. He’s got to make money so he does the bowling thing, but I think he’s just as happy playing pétanque with his senior friends. It’s an interesting thing, because on the one hand you’re doing something that’s extreme or comic or broad in its way, but also needs to feel true to life and real, because you’re simulating a documentary. So it’s an interesting assignment, trying to do both those things at once. And I think that’s often what works with comic material is just to be as invested as you otherwise would be if not more invested in the actual reality of the situation. And if it’s well-written and inherently comic, the laughs will take care of themselves. AVC: How much experience with bowling did have before this? MCH: I bowled when I was a kid and bowled in high school and college. I mean, not like on a team or anything, but you know, go out bowling with friends from time to time. In the past 20 years or whatever, I probably bowl, like, once a year. [Laughs.] I’m familiar enough with it that I was able to at least somewhat convincingly fake that I was really good at it. AVC: You’ve got the form down real well and fluid, but when the episode cuts away from you rolling the ball, where were those balls going? MCH: I think all of us had some takes where we managed to do what the script said we were doing, like get 9-10s and leave one, or get a strike. Not every time, but. We had guys who were dressed like us to try to pick up specific shots, but for the most part I think it was us. AVC: Did you get any pointers from those stand-ins? MCH: No, but a day or two before we did all the actual bowling stuff, I did get together with a guy who owns that bowling alley. This place where we shot, it’s a family business, it’s been there since the ’60s. It was amazing. And he just watched me bowl and gave me some pointers and let me know what I was doing that looked good and maybe some things I could do different just so that I looked at least passingly legit. You watch the real guys, like the guy upon which my character was based, and he’s just throwing the thing like it’s a rock. I mean throwing it so hard, and the back swing almost goes straight above his head and his back leg is up in the air, he’s sort of hopping on the leg he’s planting. I wasn’t going to pull that off. At least not if I wanted to get the ball down the lane. So I did a [Laughs.] somewhat mellower version of that. AVC: Having done this now, do you think you’ll pick up the pace with your bowling or do you think it will be a once a year sort of thing? MCH: I think realistically speaking, the pace will probably be the same. [Laughs.] I think I’ll feel more pressure to be good now. Documentary Now! paints a detailed picture of an egotistical, deranged filmmaker with "Searching for Mr. Larson"